Ingestion of raw or partly cooked meat, especially pork, lamb, or venison containing Toxoplasma cysts. Infection prevalence in countries where undercooked meat is traditionally eaten has been related to this transmission method. Oocysts may also be ingested during hand-to-mouth contact after handling undercooked meat, or from using knives, utensils, or cutting boards contaminated by raw meat. During acute toxoplasmosis, symptoms are often influenza-like: swollen lymph nodes, or muscle aches and pains that last for a month or more. Rarely, a patient with a fully functioning immune system may develop eye damage or nasal lesions from toxoplasmosis. Young children and immunocompromised patients, such as those with HIV/AIDS, those taking certain types of chemotherapy, or those who have recently received an organ transplant, may develop severe toxoplasmosis. This can cause damage to the brain (encephalitis) or the eyes (necrotizing retinochoroiditis). Only a small percentage of infected newborn babies have serious eye and brain damage or nasal malformations at birth. Swollen lymph nodes are more commonly found in the neck followed by axillae and then groin. Swelling may occur at different times after the initial infection, persist, and/or recur for various times independently of antiparasitic treatment. It is usually found at single sites in adults, but in children multiple sites may be more common. Enlarged lymph nodes will resolve within one to two months in 60% of patients. However, a quarter of patients take 2-4 months to return to normal and 8% take 4-6 months. A substantial number of patients (6%) do not return to normal until much later. 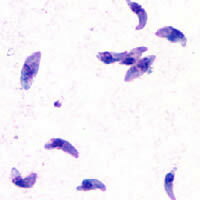 an antibiotic used in combination with pyrimethamine to treat toxoplasmosis. an antibiotic used most often for people with HIV/AIDS. an antibiotic used most often for pregnant women to prevent the infection of their child.